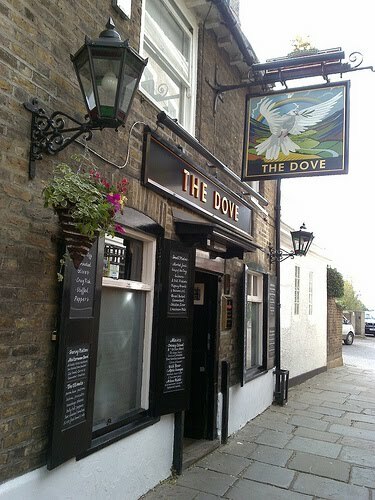 Weather like we've had in the last few days calls for being by the river, so why not consider trying to get a table on the tiny terrace overlooking the Thames at the Dove, Hammersmith, a pub which is rumoured to have the smallest bar in London. Built in the 17th century, the Observer tells us that customers have included Graham Greene, Ernest Hemingway, Dylan Thomas and Alec Guinness. Indeed, we are told that James Thomson wrote the words to Rule Britannia while living here, and it is well documented that William Morris lived nearby. It's a popular spot for the boatrace, but its draw is universal and lasts all year round so arrive early if you want to stand any chance of getting a seat for lunch. For more on the Dove, see here. I wish I was there, too, but especially on a gorgeous summer day.